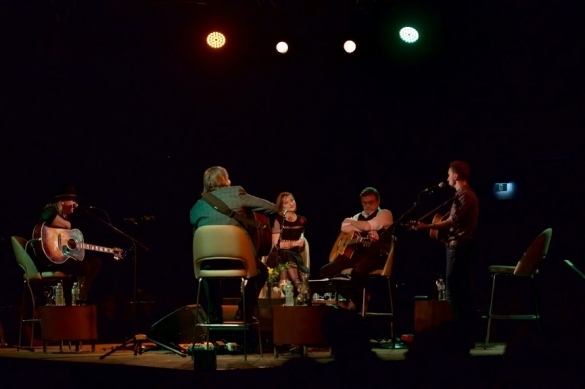 After a sellout crowd and great reviews for the first Bruce Guthro Songwriters Circle PEI, the stage has been stacked for the second show, April 5, 2019, at The Delta Prince Edward. Don’t miss this opportunity to see Maritime legends and hottest new prospects, perform some of their most popular songs while sharing in the heartache, laughter, and original stories that brought the songs to life. Bruce Guthro - needs no introduction! The recipient of numerous awards combines his musical talents with his quick wit and knack for taking the best out in his guests as they tell the stories behind their songs. Makayla Lynn Music - a very fast rising star that is the ‘next one to watch’ according to Rolling Stone Magazine, CMT USA and other prominent publications. She has already won ECMA and Music Nova Scotia awards. Irish Mythen Music - A winner of PEI Music Association & ECMA Awards. She’s opened for the likes of Rod Stewart & Gordon Lightfoot. She tours the world & has been named by music publications around the globe as a ‘must see artist’. $42.00 plus taxes and fees. ALL TICKETS ORDERED ONLINE OR BY PHONE MAY BE PICKED UP MONDAY TO FRIDAY 11am-5pm at the EASTLINK CENTRE BOX OFFICE, or day of show 1 hour prior at the DELTA PRINCE EDWARD.